Peña, 2049, C1126ABA Buenos Aires, Argentina. Hotel Howard Johnson Boutique Recoleta is located in the elegant Recoleta neighborhood of Buenos Aires. This 4-star boutique hotel offers modern rooms and an inviting spa area, just a few minutes from the city's financial district. The rooms of this hotel are equipped with air conditioning, contemporary furnishings and free Wi-Fi internet access. 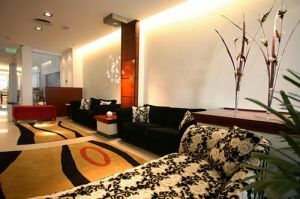 A fully equipped executive suite is also available here. Hotel's stylish boutique café offers a delicious breakfast buffet each morning. A range of hot drinks and tasty pastries is also offered. In this hotel you will be able to relax yourself in the spa where you will find a gym, hydro massage facilities, a sauna and a jacuzzi. Howard Johnson Hotel is located very near to Jorge Newbery Airport making it ideal for all sorts of trips. Centre, Near the historic centre, Near shopping centre. Visa, Maestro, Mastercard, American Express, Cabal.